With green and red 230 V LED, labelling, and pictogram. 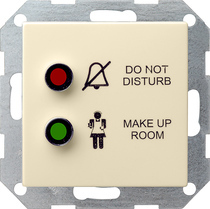 To display "Do not disturb" and "Make up room". Installation in a device box in accordance with DIN 49073 (using a deep device box is recommended).